The NSW Parliamentary Research Service has produced a paper exploring housing trends in NSW. The findings are relevant to the current affordable housing and planning debates. Below we have reproduced the executive summary. The report concludes that “Households who have not been able to gain access to home ownership have relatively little wealth of any sort”. Between 1995 and 2005, real house prices in Australia increased by more than 6 per cent annually. This was well above the average annual increase in the 20 years to 1995 of just 1.1 per cent. When compared with some other capital Australian cities, established house prices in Sydney grew at a considerably slower pace through much of the 2000s; and most capital cities experienced flat or negative growth toward the end of the 2000s. Since the end of 2012, capital city established house prices have generally increased. The median established house price in Sydney has increased by 15 per cent since December 2011. Perth (up by 9 per cent) also experienced relatively strong median house price growth over this period. As of March 2013, Sydney had the highest median established house price at $605,000, followed by Perth ($528,000) and Melbourne ($480,000). Between June 1990 and June 2013, the median NSW dwelling price (for all dwellings) increased by $339,000 (262 per cent). Price growth has been most pronounced in the Greater Sydney region where the median dwelling price in the Inner Ring of Sydney increased by $555,000; prices in the Middle and Outer Rings of Greater Sydney grew by $455,000 and $332,000 respectively. The recent upturn in the Sydney market is being led by inner Sydney which has outperformed Sydney’s overall median growth. Since the end of 2012, the median Inner Sydney Ring dwelling price grew by $70,000. The median dwelling price in the middle and outer Sydney rings also grew by $56,000 and $38,000 respectively. According to BIS Shrapnel, growth in Sydney’s median house price is forecast to continue rising by 6.5 per cent in 2013-14, 6.1 per cent in 2014-15, and 5.1 per cent in 2015-16. This growth is expected to be driven by improved State economic conditions and also by the deficiency of dwelling stock into the middle and outer suburbs. On the demand side, a number of factors have contributed to the strong growth in house prices over the last two decades: high population growth (primarily as a result of high migration); real household income growth; nominal interest rates have fallen; and financial deregulation has meant that housing finance is more readily available. Between 1991 and 2011, NSW’s population increased by 1.3 million people, with Sydney accounting for 71 per cent of this increase. New South Wales’ population increased by 92,827 persons through the year to March 2013 which represents an increase of 1.8 per cent which was the highest level of growth since the 12 months to March 2008. Between 1993 and 2000, Gross State Product (GSP) grew in NSW at an average annual rate of 4 per cent. This strong period of economic growth also corresponded with the rapid increase in real estate prices which grew at an average rate of 7.5 per cent over the same period. The move to a low-inflation environment saw interest rates fall over much of the 1990s and remain at these relatively low levels throughout the 2000s. The Productivity Commission (2004) and the Senate Select Committee on Housing Affordability in Australia (2008) both concluded that cheaper and more accessible housing finance underpinned demand and house price growth. The current monetary easing cycle has seen the cash rate fall by 225 basis points to 2.5 per cent (its lowest level in more than 50 years), which has triggered strong demand growth in the last 12 months. Prior to the late 1980s, housing demand was largely accounted for by owner occupiers. However, the rapid escalation of prices in the early 1990s, combined with structural tax changes and improved access to credit, saw residential real estate become a highly desirable form of investment. First home buyers and owner-occupiers are now not only competing with domestic investors, but also foreign investors. Upgraders and downsizers represent the largest component of residential real estate demand in NSW. In November 2013, there were 16,140 non-first home buyer (NFHB) owner occupier dwellings financed in NSW. This is above the previous 6-year monthly high of 15,264 reached in October 2013. There have been 156,751 NFHB owner occupier dwelling finance commitments over the 12 months to November 2013. This is well above the calendar average of 125,759 since 2007. NFHB demand as a proportion of owner occupier demand reached a high of 93 per cent in NSW, around 6 per cent above the Australian average. First home buyer (FHB) demand in NSW has varied over the last two decades, with the two notable periods of fluctuation corresponding directly with changes to first home owner incentive schemes in 2001 and 2009. FHB demand reached 34 per cent of all owner-occupier sales by mid-2009 (well above longer term trends and also well above the previous peak reached in 2001). With the exception of the brief upturns in 2011 and 2012, FHB demand has been in decline in NSW since peaking in 2009. In November 2013, there were 1,286 housing finance commitments to first home buyers in NSW. Over the past 12 months, there were 12,682 commitments by first home buyers, 51 per cent lower than over the same 12 month period in 2012 (25,627 commitments). First home buyer finance commitments have accounted for 7 per cent of all owner occupier finance commitments in NSW over the last 12 months. Investor activity has been trending up since the late 1980s. In 1985, investors accounted for only 13 per cent of total housing finance in Australia; as at November 2013, investors accounted for 38.5 per cent of total housing finance. This increase in investor activity has contributed to the growth in housing prices over the last 12 months. At a national level, there was $10.2 billion worth of finance commitments for investment purposes in November 2013, which was 39 per cent higher than in November 2012. Investment finance commitments were 24 per cent higher over the year over the 12 months to November 2013. Between 1995-96 and 2011-12, the value of foreign investment approvals in Australian real estate increased from $12.4 billion to $59.1 billion. In 2011-12, residential approvals accounted for $19.7 billion, with the remaining $39.4 billion tied to commercial approvals. 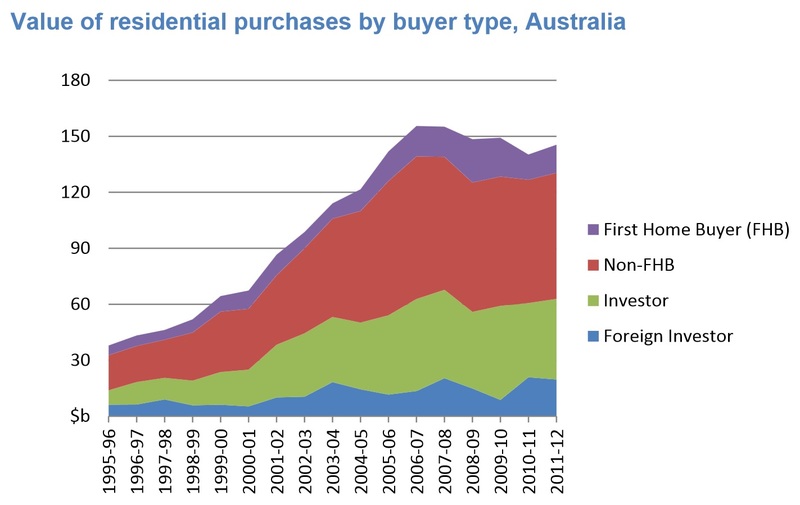 Since 1995-96, the number of foreign residential investment approvals in Australia has increased from 3,181 to 9,768. Foreign investment growth in NSW residential real estate remained relatively subdued prior to 2008-09, varying between $2 and $4 billion. Foreign investment in NSW has more than tripled between 2009-10 and 2011-12 from $1.9 billion to $6.9 billion. Since 2007-08, real estate investment in Australia from China has increased by more than $2.7 billion. Real estate investment from Singapore has also increased significantly from $1.8 billion in 2007-08 to $5.7 billion in 2011-12. The US was the largest foreign investor in Australian real estate in 2011-12 at $8.1 billion. Over the longer term, dwelling commencements have generally failed to keep pace with increases in underlying demand despite rising house prices. Annual dwelling approvals (all property types) in Australia have declined by 15 per cent since 2002, and in 2012, were at their lowest level (90,438) since 1996. Nationally, dwelling approvals have been trending up in recent months; with monthly housing approvals for October 2013 up 9 per cent since January and other dwelling approvals are up by 30 per cent. This increase in approvals is most likely a response to the rapid price rises seen across the major capital cities, including Sydney, at the end of 2012 and throughout 2013. In NSW, between 1995 and 2012, the annual number of dwelling approvals (all property types) decreased by 22 per cent from 57,528 to 36,394. This decrease was largely accounted for by the 40 per cent decline in housing approvals over this period. The number of ‘other’ dwelling approvals has fluctuated over this period, but recent downward growth has meant they remain around the 20-year historical average. Rental prices, which form a large component of a prospective home buyers housing costs, have risen consistently in NSW over the last two decades, with the growth most pronounced in the inner urban areas of Sydney. Between March 1993 and March 2013, the median rent (for all properties) in the inner ring of Sydney more than doubled from $195 to $560; while the median rent in the middle ring of Sydney increased by $300. The ratio of dwelling prices to income in Australia was relatively stable over the early to mid-1980s, but rose considerably during the late 1980s, the 1990s and the early 2000s, driven by rising dwelling prices. Between 2003 and 2012, the ratios flattened and then trended lower. Sydney’s house price to income ratio has tended to be above those of the other State capitals. Housing interest repayments in Australia have increased over the last decade as a proportion of disposable income. Throughout the 1990s, this figure fluctuated between 4 and 6 per cent. Between December 2001 and June 2008, this ratio increased from 5.1 to 10.9 per cent. This period reflected rising interest rates and declining affordability for households. While this ratio has declined following its peak in 2008, it still remains above the 20 year historical average of 6.7 per cent. Gearing (the ratio of the value of housing debt to housing assets) has nearly tripled since the late 1980s, increasing from 10.6 per cent in September 1985 to 28.4 per cent in June 2010. This can expose borrowers and owner-occupiers to financial risk and variation in interest rates which may undermine the long-term affordability of home-ownership. The most widely reported measures of home loan affordability in Australia are the Real Estate Institute of Australia Home Loan Affordability Indicator, the Commonwealth Bank of Australia–Housing Industry Association Housing Affordability Index, and the BIS Shrapnel Home Loan Affordability Index. All three indexes show that home loan affordability has fluctuated considerably in the last two decades; and while affordability improved between 2010 and 2012 following a decline in interest rates, affordability remains relatively weak on a longer term historical basis. However, the methodological and data limitations associated with these indexes prevent a complete and localised assessment of affordability. Also, these indexes are not entirely up to date. With interest rates at the bottom of the easing cycle and price growth expected to continue, the affordability problem is unlikely to improve significantly in the next few years. Sydney and Melbourne, which are the least affordable capital cities in Australia, are also ranked 3rd and 6th globally in terms of unaffordability by the Demographia International Housing Affordability Survey. Home ownership rates for young households have declined steadily since the mid-1980s and represent a negative outcome of the affordability problem in Australia. According to Battellino (2012), it may be that this is driven by demographic factors; but it is largely financially driven by unaffordability. There are wealth implications from not having affordable access to home ownership. Owner-occupiers not only own all of the owner-occupied housing wealth, they also own most of the wealth in investment housing and most non-housing wealth. Baby boomer households (born from 1945 to 1960 and in middle age in 2005-06) who were able to become home owners (most likely in the 1970s or 1980s and no later than the 1990s) have the greatest holdings of all forms of wealth. Households who have not been able to gain access to home ownership have relatively little wealth of any sort. Andrew Haylen is a Research Officer in Public Policy / Statistical Indicators at the NSW Parliamentary Research Service. The above article taken from the Executive Summary of the Briefing Paper No 01/2014 on Housing prices, ownership and affordability: Trends in New South Wales which can be found on the NSW Parliament website. The article is reproduced with permission.